SGT Dale Brehm was killed on March 18, 2006 during a raid of several houses in Ramadi, Iraq. During the nighttime strike, a gunfight began on the first floor of the house, taking Dale’s life. Also killed during the attack was SSG Ricard Barraza, 24, from Shafter, California. After graduating from Turlock Adult High School in 2000, Dale decided to join the Army in February of 2001. September 10, 2001, he called his father to share the news that he had reached his goal to become a Ranger; the next day, the 9/11 terrorist attack occurred, further solidifying his resolve to serve his country. Dale completed One Station Unit Training, Airborne School and the Ranger Indoctrination Program at Fort Benning, GA before being assigned to the 2ndBattalion in October of 2001 as a rifleman and grenadier. During his military career, Dale had served three separate deployments to Afghanistan and was in his third deployment to Iraq when he was killed. During his deployments, he was known for building his teammates up and leading by example. “SGT Brehm always demanded that the men around him gave nothing less than 100 percent with every task” Maj. Jasper Jeffers said. He worked diligently to always be the best version of himself, pushing himself and his unit members to grow. Dale was posthumously awarded a Bronze Star, Purple Heart and two Army commendation medals in recognition of his dedication and service. Although dedicated to his military service, and his brothers-in-arms, he had begun to set his sights on a new mission: building his life with his wife. In 2003, he married his high school sweetheart, Raini and had been planning to start a family upon his return from his 6thtour of duty. He was only two weeks shy of returning from duty, and three months away from leaving the military to pursue a civilian career. In addition to his wife, Raini, SGT Dale Brehm leaves behind, his mother, Laura Vawte, father and step-mother, Bill and Linda Brehm, and two stepsisters and two half-brothers. SGT Dale Brehm was 23 years old from Turlock, California. 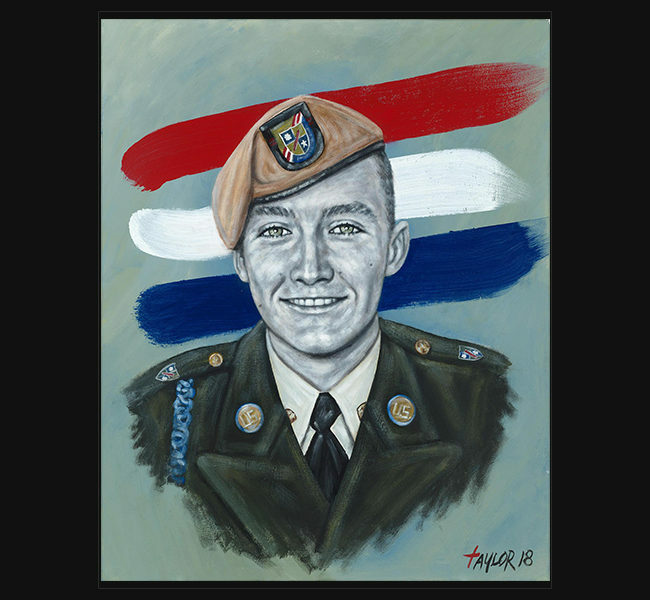 The original portrait was delivered November 11, 2018 to his mother, Laura Vawte, wife, Raini Brehm, and family in New York, NY during a special memorial ceremony presented by the Lead the Way Fund. Also presented was Army SPC Christopher Gathercole.